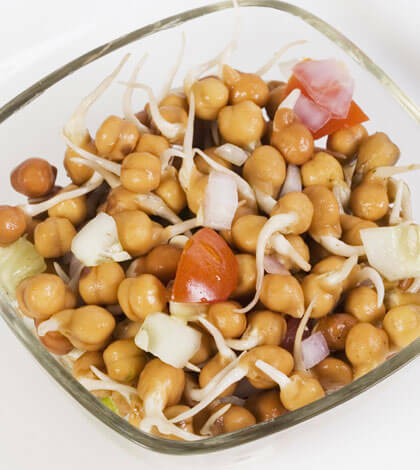 If you are a chaat lover, here is the chatpati sprouts chaat that you would want to eat. This sprouts chaat recipe has a healthy twist to it. Sprouts are a nutrition powerhouse that contains muscle-building protein, dietary fiber, as well as vitamins like vitamin K, folate, pantothenic acid, niacin, thiamin, vitamin C, vitamin A, and riboflavin. It contains minerals like manganese, copper, zinc, magnesium, iron, and calcium. We must tell you that the heart of the chaat lies in the sauces otherwise the potato is just a filler. If you can recreate the magic with sprouts, then it is the best of both the worlds: health and taste. Heat oil in a pressure cooker and add cumin seeds, turmeric, green chili, ginger, and mix. Add sprouts, chili powder, salt, water and cook for 10 mins. In a bowl, add the cooked sprouts, curd, tamarind pulp, pepper, chili powder, coriander leaves, onion and protein crispies.